Sierra Leone international Alhaji Kamara, who defied a medical diagnosis to continue playing football, is hoping to resurrect his career after joining Vendsyssel in Denmark, as a free agent. The 24-year old forward has signed a short term deal with the Danish top flight league side until the end of the season. A delighted Kamara says he will have to wait a few more weeks to get on to the pitch as he recovers from a hernia operation. "I'm happy to be part of Vendyssel and I'm hoping to bounce back," Kamara told BBC Sport. "I decided to choose Vendyssel because they understand my situation. They know that I need time to recover from my operation," he said. Kamara has been out of action since August 2018 when he left Moldovan giants FC Sheriff where he scored nine goals in 14 league appearances. He says he is keen to get back playing football regularly and says he has a job to do. "I hope to be fully fit in time for the relegation play-off so that I can give my best to help Vendyssel to stay in the top flight. "I'm also hoping that the Danish league will create more opportunities for me to play in the big leagues in Europe," Kamara added. Vendyssel Sports Director Ole Nielsen confirmed they will give Kamara more time to regain his fitness. "Kamara is a really talented attacker who has previously proven that he can score goals," Nielsen told the club website. "However, we are aware that when we pick up a player at this time, he will have to spend some time getting in the same match form as the other squad members. "We expect him to be built up in the first two to four weeks, so he is ready to make a crucial difference for us in the play-offs." 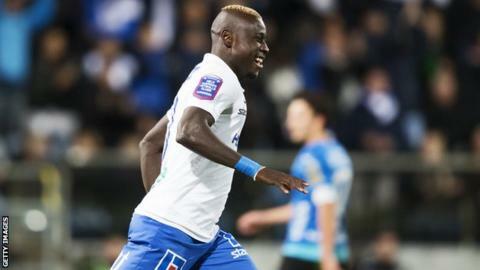 Kamara's career was briefly halted three years ago just after winning the 2015 Swedish league title with Norrkoping, the only silverware so far in his career. Doctors declared that the striker had a heart defect whilst at Norrkoping. after he underwent a mandatory Uefa medical examination before the club's participation in the European Champions League qualifiers. After further tests in the USA later in 2016, he was given medical clearance to resume his career and was signed by MLS club DC United. Kamara had always insisted that he was in good health. He went on to play for USA second tier team Richmond Kickers, Al-Taawoun in Saudi Arabia and FC Sheriff in Moldova where he played in both the Uefa Champions League and Europa League qualifiers. Kamara has not played for Sierra Leone since his heart diagnosis was made. His last match was against Chad in a 2018 Africa Cup of Nations qualifier in Port Harcourt in October 2015. He scored one of his country's goals in a 2-1 victory but it was not enough to eliminate Chad.